The Apple iPhone & More! After about three years of rumors and thousands of mock ups of an Apple Phone, the iPhone has finally been announced. Apple’s “reinvented phone” features a wide screen display, full iPod functions, touch controls, email client, web browser, and much more. The new device is more of a powerful smart-phone rather than a regular cell phone. “iPhone is a revolutionary and magical product that is literally five years ahead of any other mobile phone,” Steve Jobs, Apple CEO. Apple has eliminated the entire idea of a solid QWERTY keyboard, which appear on phones such as the RIM Blackberry and Palm Treo. According to their ideology, keyboards are a waste of space when not in use. To solve the issue they have replaced it with a touch sensitive virtual smart keyboard. The onscreen keyboard will appear while composing SMS messages, emails, chatting, or performing similar actions. Apple has “reinvented” voicemail as we know it. With the iPhone and Cingular service, Visual Voicemail will allow viewing messages in a list (similar to an email inbox) rather than having to call up a server and skip through multiple messages. With a click, any selected message can be played back instantly and can be paused/rewinded/forwarded like a song. 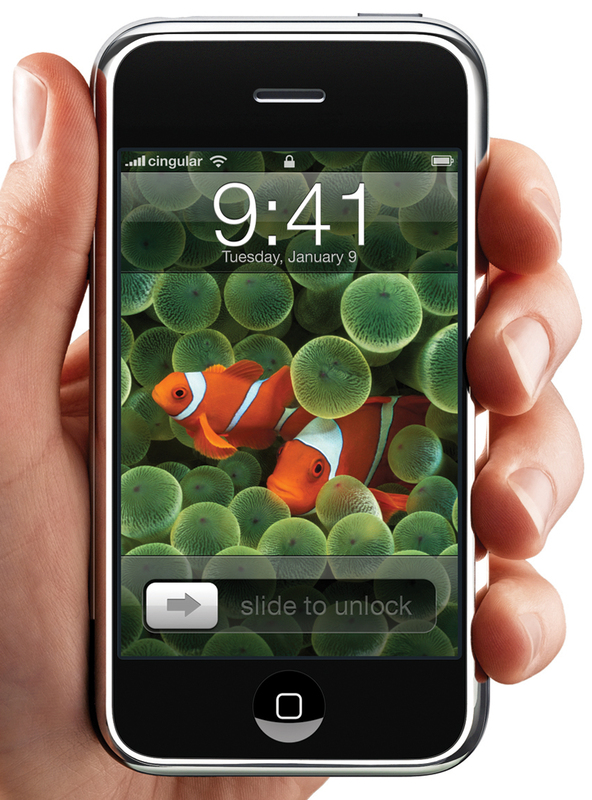 The iPhone has “built-in iPod” which utilizes a 3.5-inch widescreen display. The unit is controlled using completely touch-sensitive controls. A new “scrolling” method is used to browse through lists of songs, albums, artists, or playlists. 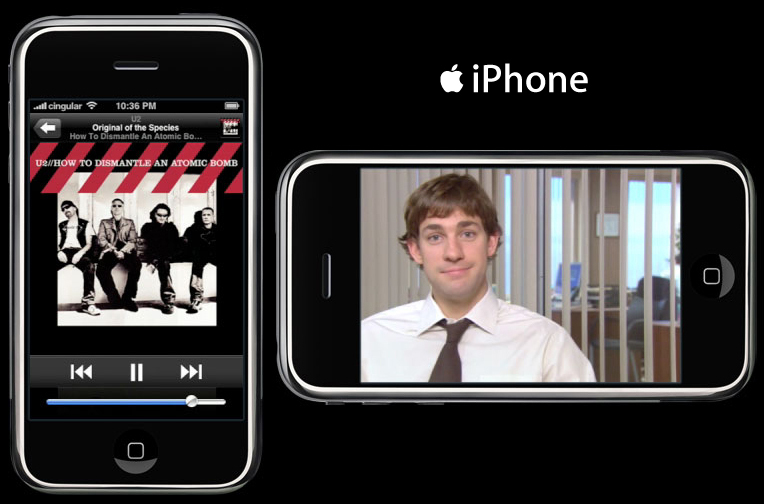 In addition to music, the iPhone supports playback of TV shows, movies (widescreen), audio books, podcasts (video and audio), and viewing photos. A cool feature it includes is the Cover Flow effect which appears while playing music, which was introduced into iTunes 7.0. The iPhone includes a 30pin standard iPod connector. Data can be transferred between the phone and the unit using a standard USB cable. The iPhone will continue to use iTunes (probably v7.1) to manage music, video, and photos, in addition to phone book contacts and calendar. Unlike most smart phones, the iPhone features a full rich HTML email client. The unit can fetch email in the background using POP3 or IMAP services. It is already known to support Microsoft Exchange, Apple Mail, AOL, and Gmail for sure. 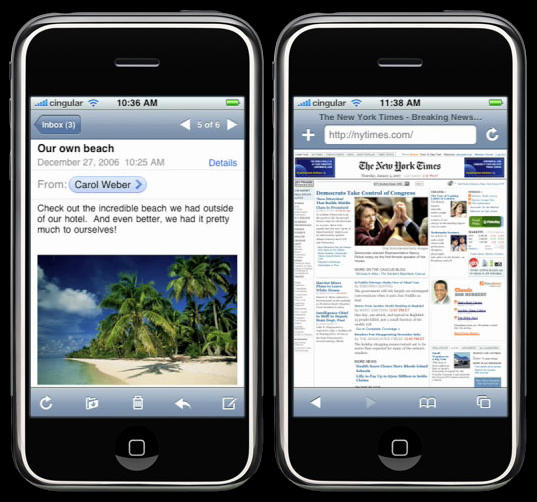 In addition to mail, the unit features an advance Safari browser and can view regular web pages rather than having to visit special mobile websites. All web communications can be performed using either a local WiFi network or Cingular’s EDGE service. After making a deal with Google, the Apple iPhone will include a variety of Google services built into the phone. A portable edition of Google Maps will be included on the phone and will offer maps, directions, traffic, and even satellite images. Google can also be found as the default search engine for their web browser. More services will be announced later. According to Apple, the phone will be available in 2 models: 4GB and 8GB. The units will retail for $499 and $599, respectively, with a Cingular contract. The phone will be available in Apple’s and Cingular’s online and retail stores sometime in June 2007. Apple also made a few other announcements yesterday in addition to the iPhone. The Apple TV, originally named iTV, was announced for launch in February 2007 for $299. The AppleTV features a 40GB hard drive, WiFi 802.llb/g/n, and HDMI 720p support. The purpose of the unit is to easily bring content from Macs or PCs to home TVs. With a Apple TV plugged in, you can access downloaded movies, music, photos, and more. Apple also stated that the reached a record setting 2 Billion Songs sold on iTunes since it first opened. A new deal with Paramount will bring add 150 movies to the iTunes Store. Finally, Apple Computers has changed their name to simply “Apple” because they are no longer just in the computer market. Where can i order one and how long will it take to come to perth? or where can i buy one in Perth? And also how much are they about? heyy dis a new wik as fone … ye i also wonna no were i can get 1 in perth id luv 2 have 1 ….